This article reviews the proposition that a 4:1 'current balun' in the style of Guanella can be constructed with both pairs of windings sharing a common magnetic circuit. 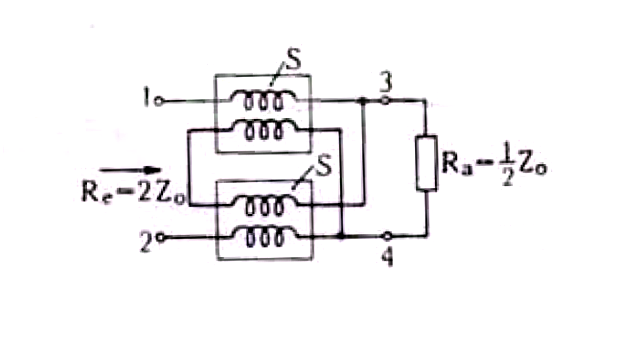 Fig 1 is from Guanella's paper, and it shows his 4:1 balun with two independent 1:1 transmission line transformers as described earlier in the same article in a series / parallel arrangement. This type of balun is often termed a 'current balun' because of its tendency to force equal (but opposite in direction) currents in each leg of the balanced connection, irrespective of the voltages on those legs. Guanella describes each of the transformers in his 4:1 balun transformer as a two wire transmission line that is wound in a helix. His device uses an air core, and the two component transformers are show with no flux coupling. Fig 2 is a Guanella 4:1 balun and a symmetric load arranged with the unbalanced input on the left and balanced output on the right. This article focuses on a low frequency behaviour of the circuit because it is easily explained without recourse to complex transmission line mathematics. the differential voltage at both ends of the transmission line are approximately equal. The above two properties are also the properties of an ideal flux linked transformer with equal turns, so each of the transformers can be replaced with an ideal flux linked transformer with equal turns. Fig 3 is a Guanella 4:1 balun and load. The solution to this proposed low frequency equivalent circuit of the network is that I1 equals I2 irrespective of the values of Z1 and Z2. The proposed low frequency equivalent circuit explains how Guanella's 4:1 balun (with independent transformers) drives equal currents in each side of the balanced load. Note that Va is not necessarily equal to Vb, consequently the flux levels in to the cores are not necessarily equal. This warns that placing the two pairs of windings on a common magnetic circuit which tends for force equal flux will change the circuit operation. Fig 4 shows the series aiding configuration. 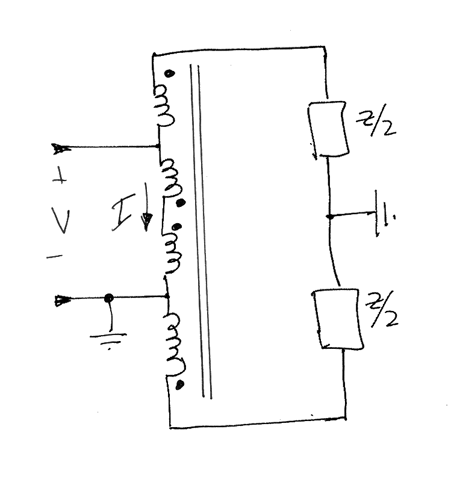 Because the single transformer with 4 equal windings is 100% flux linked (being ideal), the voltage difference across all windings is the same, and equal to V/2. 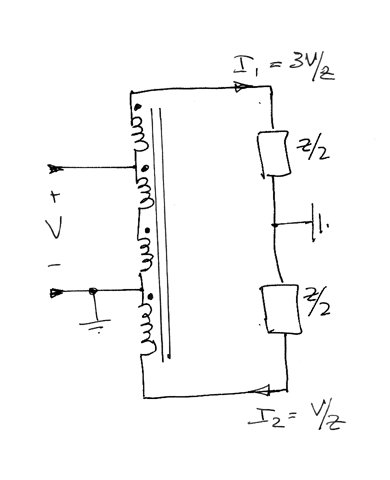 The currents I1 and I2 in each half of the symmetric load can be calculated as 3V/Z and V/Z. In this case, the currents in each leg of the balanced load are very different, one is 300% of the other, so the configuration is a failure in its attempt to drive equal currents in each leg of the balanced output. Fig 5 shows the series opposing configuration. Because the single transformer with 4 equal windings is 100% flux linked (being ideal), the voltage difference across all windings is the same. Note the phasing of the two inner windings, the only way in which the voltages across each windings is equal is that V is zero, and of course the output voltage in that case is also zero. In this case, the two inner windings offer a low impedance path to current, effectively short circuiting the input leads which renders the device useless for its intended purpose. The discussion above was low frequency analysis using an ideal transformer approximation. In both a real flux linked transformer implementation, and the real transmission line implementation, there will be flux leakage. The effect of the flux leakage is that the configurations described in Fig 4 and Fig 5 will work better than described, and the greater the flux leakage, the better they will work. In fact, if no flux from one pair of windings cuts the other pair of windings, the device will work as well as possible... but it does not then share a common magnetic circuit. Measurements made on such baluns wound on low permeability cores such as #2 powdered iron mix have very high flux leakage, and an observer might be tricked into thinking that they were working after a fashion. Guanella did not describe a single core 4:1 current balun, and attempts to label the configurations in Fig 4 and Fig 5 as Guanella's are incorrect. It is argued by some, including (Sevick 2001), that the Guanella 4:1 balun can be constructed on a shared magnetic circuit, provided that the load is floating, ie that there is no current flow from any part of the load to ground. That is true, but not practical in an antenna scenario, as it is most unlikely that a real life antenna would even substantially meet that requirement at one frequency, much less over a range of frequencies. It is a mathematical exercise that has no relation to real world stray capacitance is added to real antennas and feed lines. It is plainly obvious that the current into one terminal of a floating two terminal load MUST equal the current out of the other terminal... there is no need for a current balun as currents are necessarily equal in magnitude and opposite in phase, and the balun is effective ONLY because the load defines the current balance conditions. The notion that a current balun works, so long as the load allows load terminal voltages of 3*Vin/2 and -1*Vin/2 is a denial of the purpose of a current balun which is to cause approximately equal but opposite phase currents irrespective of terminal voltage. a low frequency analysis of both possible configurations of winding the transformer using Guanella's 4:1 configuration but on a single magnetic circuit shows that the circuit does not achieve its intended purpose. Sevick, J. 2001. Transmission line transformers 4th Ed. Noble Publishing Co. 9-15.